We are all aware of the current exhibition at the Dixon, “Present Tense.” Regardless of the reason, the Dixon is only so big, only has so much wall and floor space available to exhibit work. So, choices had to be made and some artists had to be left out. 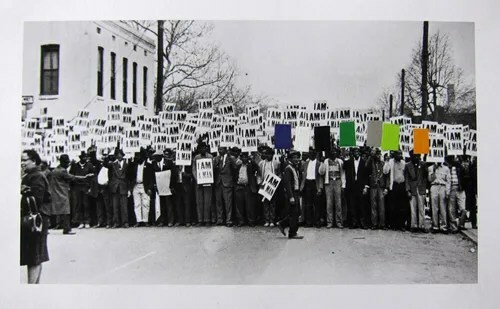 This Dixon exhibition has generated a lot of talk within the Visual Arts Community of Memphis. Which is a good thing. And I want nothing else than to be able to have this conversation continue somehow, someway. That is what the show “Hanging Particles” is all about. It is artists that were not included in the Dixon exhibition. This is in no way a second place, second tier grouping of artist and should not be thought of as such. It is simply just a continuation of the work and the discourse generated from the “Present Tense” exhibition. Curated by Memphis’ Own Dwayne Butcher. This entry was posted in News and Exhibitions and tagged Dwayne Butcher, Exhibition, Gus' Fried Chicken, Marshall Arts, Memphis. Bookmark the permalink.